new merchandise from Creepy Co. starting next week. they've been putting out a lot of horror themed items, including some well done GPK stuff. Cool to see WP joining the lineup. That is awesome! I would love a Creature Crackers shirt, or maybe Doomed Matches. First look at some enamel pins. Pins are all the rage right now it seems. Often well-rendered, inexpensive, don’t take up much space and easy to add to shirts, backpacks, lanyards, etc. Pins are cool but I don't see myself ever wearing one. T shirts yes. So what do you think the size of these pins are? I'm guess a square inch or so, but have no idea. And would one pin have multiple images like this one? Looking forward to what they have to offer! Thanks! That makes sense. It'll be interesting to see which tiles, and from which eras, they choose as their subjects. The release for all shirts and pins are at Wednesday July 17, at 7 PM Central. I definitely like the shirt, and am looking forward to what other titles make it on shirts. 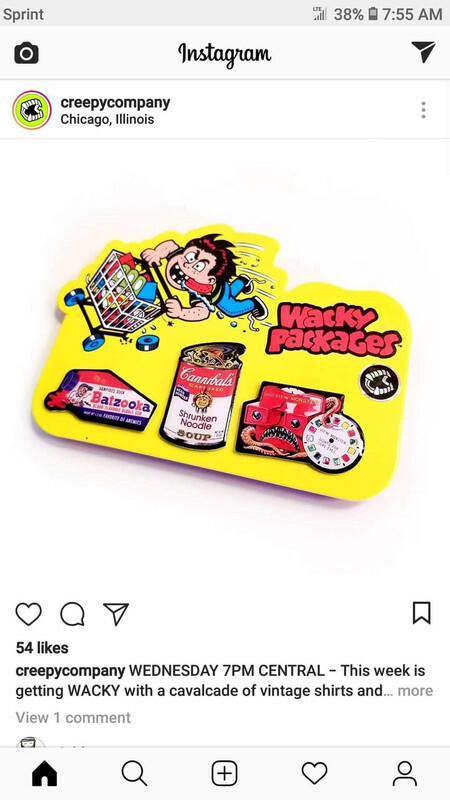 I might pick up a pin pack if it is cheap, but not really a necessity to me. 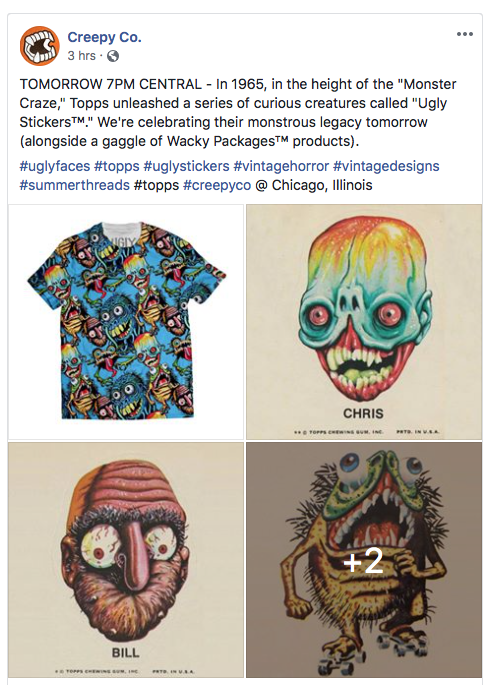 today's sneak peek info about tomorrow's big releases from Creepy Co. is for the Ugly Stickers license. Perhaps I'm overly critical, but I am disappointed with the Fang shirt - it does not include the "package" and appears to have very simplified character artwork compared to the actual Wacky. 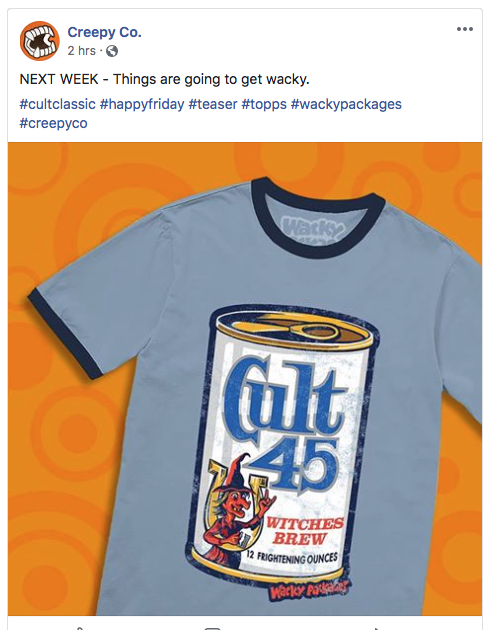 the cult 45 above has a similar simplified rendering of the art and character. We'll see tonight how the others look. 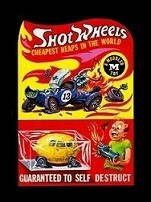 They didn't do that with the gpk and only slightly to the Ugly's. 10again did a number that were 'package-less' as well. Some were more effective than others. For me the Fang still works. I could go with 'package-less' if the art was at least well rendered. Hopefully they'll come out with some more shirt choices soon. I would have paid $15-20 for a shirt. Plus, the only shirts are the two they showed. Nothing else. Nada. Was really hoping for Bloodweiser, Ghoul Humor, Creature Crackers, etc. I thought these were going to be limited as well, but they aren't. I'm suspecting to see these on eBay tomorrow for $50+. this sale. I thought maybe 6 different shirts. sell they will do more. No 3xl in Fang, That's a letdown. Oh well i got my Sick Sid T shirt from Fright rags ordered. Don't know if they have the offer going, but in the past there was a discount code for signing up to their email list. I thought maybe 6 different shirts. No 3xl in Fang, That's a letdown. 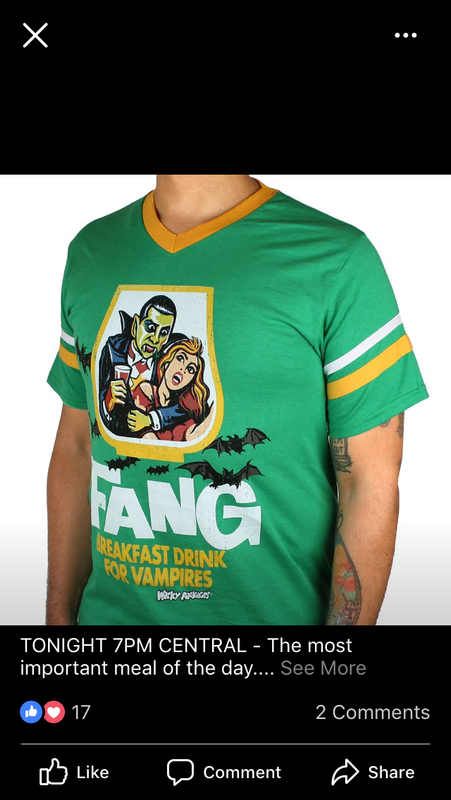 They have my size in Fang, but I just don't like it enough to spend that kind of money on it. Gonna wait it out for the week and see what else comes along. Wow, that was disappointing. I'll certainly keep my eyes peeled for better offerings, but it was limited and expensive (for the shirts) and very questionable choices for the pins. I think I would have been far more open to the pins (as I have plenty of shirts), but that choice of images was poor. I looked at the GPK offerings, and they seemed much better. I'm hoping for some better options in the future. Instead of Cannibal's for the pins, they should have done Campy. Maybe that wasn't creepy enough for them? Love the Ugly Stickers shirt! That's a great idea! Hopefully they'll do it. Also hoping for more choices in pins and shirts soon.